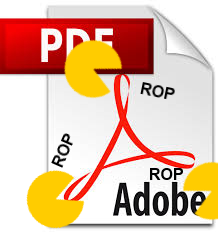 Back in February an Adobe Reader zero-day was found being actively exploited in the wild. You may have seen an analysis of the malware in a number of places. I recently came across a variant of this malware and figured it would be nice to provide a little more information on the ROP chain contained within the exploit. After Adobe was notified of the exploit their analysis yielded two vulnerabilities: CVE-2013-0640 and CVE-2013-0641. Initially the ambiguity of the vulnerability descriptions within the advisories made it hard to tell if both CVE-2013-0640 and CVE-2013-0641 were being exploited in the variant I came across - but from what I can put together, CVE-2013-0640 was used in the initial exploit for memory address disclosure and code execution. Then the exploit transfers control to another DLL that escapes the Adobe Reader sandbox by exploiting CVE-2013-0641. 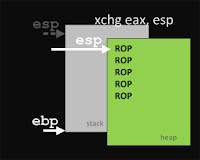 In this section we'll cover the general characteristics of the exploit that serve as an important background but are not directly part of the ROP chain. The author developed entire ROP chains for each version, this surely took some time to do. I looked at 10.1.2.45, which is the focus of this article. The address leak vulnerability in AcroForm.api facilitated an ASLR bypass by providing the module load address of AcroForm.api. The exploit writers had to first trigger the vulnerability, get the module load address, then adjust the offsets in the ROP chain at runtime before loading it into memory. As you can see, there are two methods here, the simple "getUnescape(moduleLoadAddr+0x17);" and the more complex "getUnescape(STACK_PIVOT - idaLoadAddr + moduleLoadAddr);". When the breakpoint is reached, we can look at where the stack pointer is pointing. Since it's pointing at memory on the heap (and not the stack) we know the stack pivot executed. Which is the hexadecimal equivalent of the unicode string "Module". Appended to that is a larger block of data. Later on we'll determine that the ROP chain searches the process memory for this specific delimiter("Module") to identify the block which is the start of a base64 encoded DLL that gets loaded as the payload. The first thing the ROP Chain does is note where it is in memory. We'll see later on that it does this so it can dynamically modify the arguments passed to the functions it calls rather using static values. The r variable is returned to the caller as the ROP chain, the ue() returns an unescape()'ed string from the parameters it was passed and the t variable is the AcroForm.api module load address. The pseudocode above shows that a number of calls, particularly the ones to LoadLibraryA() and GetProcAddress(), require strings as arguments. 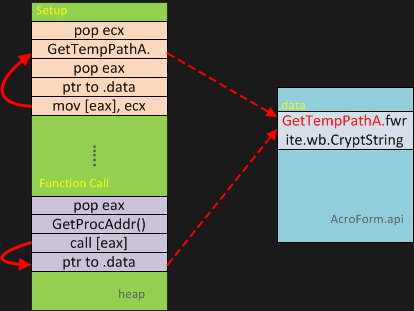 The ROP Chain accomplishes this by directly copying the strings into the .data segment of AcroForm.api. As you can see, the strings for each of the function arguments are present. One note is the use of 0xcccc0240 as the offset. It turns to 0x00000240 after the movsx edi, di. My guess is that the author was trying to avoid nulls within the chain, but if you look at the other areas of the payload, there are tons of nulls used. This implies that the use of nulls is not needed, making it extra, unneeded work by the author. It makes me wonder if it indicates an automatically generated ROP chain or possibly a borrowed chain from another exploit. At the end of this set of instructions, the memory address on the stack of the pointer to the .rdata "Module resides in ecx. At this point, the stack is populated with the appropriate parameters at the appropriate places so that the call to wcsstr() can search the memory region where the ROP Chain is for the unicode string of "Module" - which indicates the start of the payload. r+=getUnescape(moduleLoadAddr+0x816e96); // ptr to "MSVCR90.dll"
This is a pretty simple set of instructions, the author loads the address in the import table for LoadLibraryA() into eax then calls it. 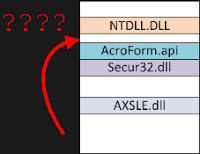 When LoadLibraryA() looks on the stack for its parameters, it'll see the pointer to the .rdata segment of AcroForm.api which contains to the string "MSVCR90.dll". 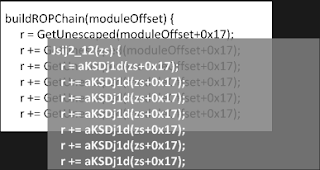 The return value is a handle to the module set in eax and then immediately copied to ecx. Next the author has to save the handle at the specific offset on the stack where the next call to GetProcAddress will look for it. This should look familiar, its essentially the same sequence of instructions that the author used to set up the stack for the wcsstr() call (that hasn't happened yet). GetProcAddress will return the address of wcsstr() in eax. The wcsstr() function parameters were already set up earlier on, so all that's left is to call eax. The last line adjusts eax so that it points to the start of the payload, and not at the "Module" delimiter. Now the ROP Chain has a pointer to the compressed base64 encoded DLL. The rest of the chain decodes (CryptStringToBinaryA), decompresses (RtlDecompressBuffer) and writes the DLL to "C:\Users\user\AppData\Local\Temp\D.T" using the same high level gadgets just described in this section. It uses GetTempPathA() to determine the user's temporary file store, which is where the DLL is saved. With the D.T DLL written to disk, loading is just a matter of calling LoadLibraryA(). The DLL automatically starts it own thread and the remainder of the ROP Chain is just a call to Sleep(). Here's the ROP Chain in its entirety, I manually deobfuscated it and added the assembly annotations. r+=getUnescape(moduleLoadAddr+0x2df56d); //add eax, 0ch/ret ; Points to after "Module"
r+=getUnescape(0x41414141); // Placeholder for the address of "Crypt32.dll"
r+=getUnescape(moduleLoadAddr+0x818033); //prt to str "RtlDecompressBuffer"
r+=getUnescape(moduleLoadAddr+0x818052); //scratch_space + 52 ptr to "756f7365"
r+=getUnescape(moduleLoadAddr+0x818015); //scratch_space + 15 ; points to "wb"
r+=getUnescape(moduleLoadAddr+0x51f5fd); //pop eax/ret - Useless?